The Florida panhandle, the rural South. 1942. On a day that seemed like any other, a nineteen-year-old girl goes for an ordinary walk only to find herself on an extraordinary hitchhiking trek across the country—a trek that creates a geographic and emotional blueprint for her life. Spanning almost nine decades and much of the U.S., About Earline traces Earline’s life as she joins a carnival and becomes Electra, returns home to face her memories, then moves forward in an essentially unconventional life filled with challenges and heartbreak as well as discovery and adventure. Author Carol Ann Wilson relates the difficult life circumstances confronting her mother, Earline, the often humorous and outrageous responses she devises, and the courageous and determined spirit in which she does it all. In About Earline Carol Wilson writes of her mother with such love that she can show us Earline as she is, neither sugar-coating the story nor humbling her subject. And her subject is really something! 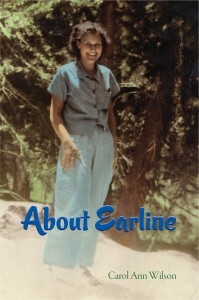 Earline proves once again that extraordinary lives can spring — vault! — from ordinary circumstances. All it takes is enough daring, determination, and resilience for six people and an enormous capacity for friendship and you too might create a life of amazing adventures, misadventures, and narrow escapes.